We made it home safely from leadership but I must say, I wish I was back in Nashville! I cannot believe the snow here! At least it's supposed to warm up later this week. Leadership was a blast - apart from the crazy long days, it was the best one I've been to. We met so many new friends and got to see some old friends. There were so many fabulous announcements, giveaways and the make & takes were AMAZING! The managers reception was incredible - they bused us to the Wildhorse Saloon - sooo much fun. The photo is a few of us from the We CAN Stamp group (back row: Trisha, Christy, Lorna and Winona; front row: Corrina, Donna and me) who qualified for the reception. Before we boarded the bus, they gave us all cowboy hats, so we had to take a photo. I will try to post a few more leadership photos over the next week or so. For now, I do have a project to share. This is another swap, created by Winona Semler, that I received. I love the colors and that Baja Breeze seam binding - beautiful! 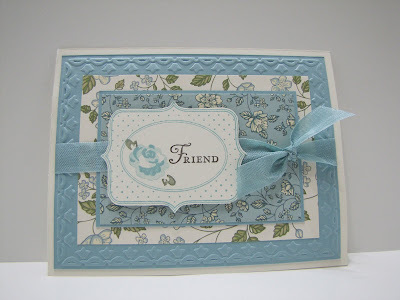 Accessories: Framed Tulips embossing folder (121809); Baja Breeze seam binding (122331) and dimensionals (104430).